Jim Paradine (O’Keeffe) is a Miami Cop On The Edge who is tired of the justice system continually releasing criminals back into society. He has a loving wife and daughter, and is about to take two weeks vacation. Suddenly a gang of thugs carjack the family, and end up killing Paradine’s two beloved family members, and shooting him as well. Though left for dead, he does what would only be natural after an event like that, he moves to a snowy, rural location, grows a beard, and becomes a mountain man. When the same gang of baddies shows up in this cold, remote location and disrupts his life again, Paradine gets revenge one by one, and even Sheriff Mantee (Williamson) can’t stop him. Will Paradine use his white coveralls while stalking through the snow to eliminate the criminal scum and become the ultimate SILENT HUNTER? Silent Hunter was directed by Fred, who gave himself a modest supporting role as the Sheriff. He graciously made Miles O’Keeffe the main hero, instead of himself. We’re definitely fans of O’Keeffe, having enjoyed his performances in Cartel (1990) and Zero Tolerance (1994) - though not so much in Liberty & Bash (1989), but we’ll let that one go because it wasn’t his fault that movie sucked. When he grows his beard and long hair, it’s surprising how much he looks like Ashton Kutcher. When the movie starts out, he’s on the streets of Miami, battling it out with goons with outstanding hair. The next thing you know, we’re in the midst of a snowy wilderness slog. The movie should have stayed with what was going on in the first third, where ideally Miles battles a bunch of meatheads until he finally gets revenge on his attackers. That’s almost what happens in the wilderness, but it takes a patience-testing 97 minutes to get there. Silent Hunter, while not too bad, should have been shorter and snappier. While O’Keeffe is good, Fred is good in his limited screen time, and Jason Cavalier, who plays the role of the classic 90’s psychotic, cliche-spouting baddie, Dewey, is good, truly the movie is stolen by one Dakota Horvath. Who is Dakota Horvath you ask? Well, he can only be described as a “pint-sized Sinatra” - a young tot who, dressed in a tuxedo, belts out a classic tune like a man four times his age. This occurs at Paradine’s daughter Kathy’s (Rafuls) birthday party. This is the sort of entertainment normally seen at a 12 year old girl’s birthday party, right? Our hats go off to you, Dakota Horvath, wherever you are. So while the momentum slows during its overlong running time, Silent Hunter isn’t without some redeeming qualities. Like the song, “You’re A Long Way From Home”, by Raymond Fabi and Mark Hillard, and interestingly there is a poster for the movie Scarecrows (1988) on someone’s office wall. While it’s not a showcase for onscreen Fred, Silent Hunter makes a relatively decent one-time watch. I always wondered why Miles O'Keeffe didn't get to play more leads. This is probably the best movie he did as the lead. 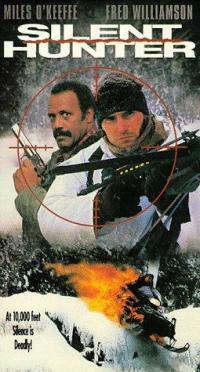 Fred Williamson, the director, gives a surprisingly minor role for Fred Williamson, the actor. I have always enjoyed snowbound movies for their great scenery. The US DVD is widescreen and on the same disc is Frank Zagarino's Never Say Die, which is equally good. Miles O'Keefe is very underrated. Cartel is one of his best...but steer clear of Liberty and Bash. Saw Never Say Die a long time ago, liked Drago in it...will have to re-watch it one of these days. Thanks for the mention! Yeah, this is one of those ones for real bad movie veterans, because it's so bad it takes a lot of solid riffing to get through it. No problem! Haha, agreed, we were making fun of it for most of the running time. Sound sounds like a John McClane-wannabe in a Cliffhanger type setting having to rely on some First Blood type training to survive in the wild. It's basically that in a nutshell. Haha.